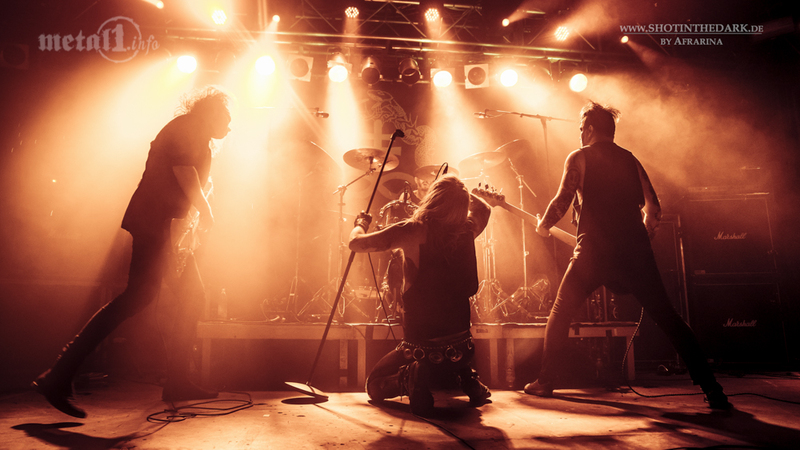 With their strong album debut „Worlds Open, Worlds Collide“ and a European tour supporting Taake, ONE TAIL, ONE HEAD could have finally kick-started their carreer after twelve years of band history. Guitarist Jan Even Åsli explains, why the Norwegians decided to break up the band instead, with what feelings they approached the shows and what his musical plans for the time after ONE TAIL, ONE HEAD are. ONE TAIL, ONE HEAD was founded 12 years ago. What was the idea behind your bandname back then? It’s a line taken from the lyrics to the first ever song we wrote, and it simply pointed cyclical patterns of death and rebirth, figuratively and literally, which from then on became the overarching theme usually present in some way or another in the words written for our music. We chose it because it sounded strange and even looked strange for a band like ours. Your debut is called „Worlds Open, Worlds Collide“. What’s the album about? Well, it’s themes are loose and suggestive, so it’s open for interpretation by the listener and will probably be different for anyone. For me it deals largely with doubt, broken illusions, shattered truths. It walks on an edge between certainty and uncertainty, control and chaos, reality and madness. Hope and despair are these worlds that are colliding, again and again, for me. The words are also mocking themselves, in a way. They seem at times grandiose and megalomaniacal, but doubt and fear of futility always lurks behind, so there is this constant tension there. A sinister twist of dark and ironic humour, if you will. What was the concept behind the artwork, how would you interpretate it? It reflects the tastes of our bassist Tylden and myself, who chiefly brought it forth together during a long period of discussion and sharing ideas (him doing the actual hands-on work with his graphical skills, of course). We obviously wanted something that had a feeling of its own, and did not look like every other album layout in our little part of the metal underground. The dark red coloring very much hints to the atmosphere of our live performances, and the simple yet extremely classy (in our humble opinion) and very effective artwork by our dear friend Izzy communicates the contents of the album perfectly. We are very, very pleased with the outcome of it all. All formats look splendid so far. With „Sordid Sanctitude“ there is a quite long instrumental on the album. Don’t you think, vocals could have added some extra energy here as well? I rather think it provides some much needed space to breathe and gather oneself. The vocals are hyper-present on this record, and while they are superbly well-executed (again, my humble opinion) having a vocalist constantly shout and scream at you for up towards 50 minutes does not fit my idea of the dynamic balance the construction of an album should have. „Sordid…“ also deepens the mood and broadens the horizon of the record with its experimental guitars and bass patterns and an in general rather strange atmosphere. But hey, I’m pretty biased. 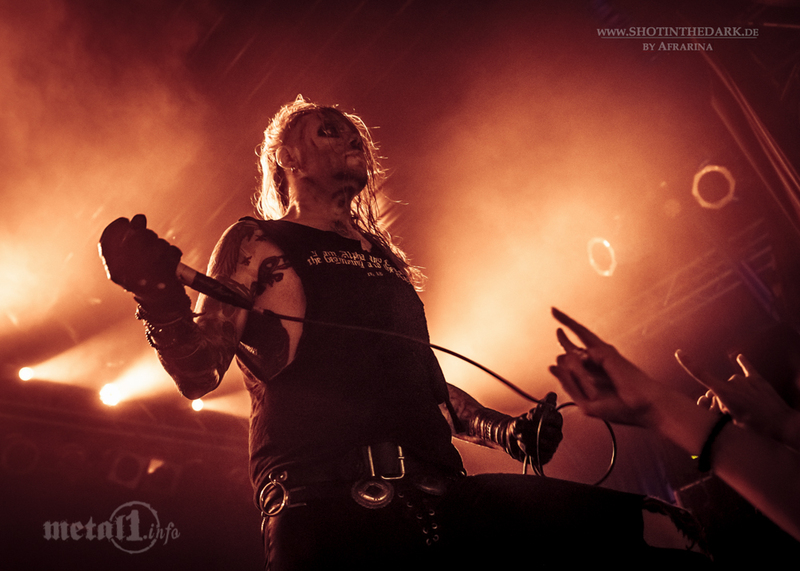 You’ve been on tour with Taake for some weeks now – what memories and experiences did you bring back from the tour? It was all in all a great experience, extremely rewarding as a means of making our last mark and quite emotional in the sense of feeling the end directly on our skin. We actually did some of our best live work ever on this tour, and that feels very good. A lot of supportive energy in the crowds throughout Europe, much more than we expected to be sure. We also had the privilege of forming strong bonds of friendship with members of all bands, which is by my understanding more than you can expect, really, so our eternal gratitude goes out to Taake, Bölzer, Orkan and Slegest for being their excellent selves. The tour was both your first big tour and your last. With what feelings did you play the last shows? As mentioned to whole thing bore the tinge of heartache, but besides that, we did our job every night, no holds barred, giving our all, not sparing anything. That has always been the same for us, and these being our last shows does not change that. What made you decide to bury the band right now, when you had international success with the album and the tour? We are pulling in different directions within the band, both in terms of creativity, methodology and outlook. We want to express ourselves in different ways. Simple as that. When our hearts are not in the same place, it’s better to make this album our definitive statement and move on. Isn’t it also unsatisfactory to have worked so long towards something, and now that success is coming, to only be able to savour it so briefly? There are many ways to define and measure success. One is to sell out shows, be popular and so forth, another is to create an expression that is truly your own, and yet another is to feel truly aligned with what you are creating, all aspects included. They are legitimate ways, all of them. It’s just that we care more for the latter, you know? And ONE TAIL, ONE HEAD was always a goal in itself, not a tool to achieve another. Life is short and it is what it is. I had the feeling that you were very well received by the audience. Do you already regret the decision, or is it still certain that this tour was the last thing we will have heard from ONE TAIL, ONE HEAD? No regrets. As of now, this is the end. I see what you’re hinting at, and a lot of people did just flat out not believe us when we said we were quitting, and I understand that, in a way. Out of experience, I think it is a rather stupid thing to say „never“. That said, this has a pretty definite feel of finality to it. One thing is the reasons already mentioned, another is the personal life changes we all go through in our private spheres. The hyper-physical and ridiculously extroverted nature of ONE TAIL, ONE HEAD was very demanding and I think it was rather obvious that it would not last forever. As humans we all struggle to let go of things, but sometimes it truly is for the best. If ONE TAIL, ONE HEAD is dead now – where do you see your future as a musician? Will you concentrate more on VEMOD again, or maybe start something completely new? VEMOD is at the heart of my very being, and therefore at the heart of my musical future as well. I’ve been working on it for more than half my life, so unless I’m stricken by serious illness of some sort, those interested will hear much more from this little universe we have created. Of course, ending ONE TAIL, ONE HEAD frees up a lot of time, and who knows what will come in its wake. There are certainly impulses that does not necessarily fit within VEMOD, so the likehood of new projects are certainly there. I feel quite certain you will hear from all of the members of ONE TAIL, ONE HEAD in various new constellations, as none of us are done with music. Thank you for the interview! Please let us do a short brainstorming in the end of this interview. I’m sorry, but I don’t particularly like the idea of „short brainstorming“ around deeply complex human phenomena that individuals can spend lifetimes studying without even coming close to properly explaining. I hope you will excuse me for refraining from adding more shallowness in a time so desperate for deep thought. Listen to good music, take good care of each other and be well. Thanks for your time. 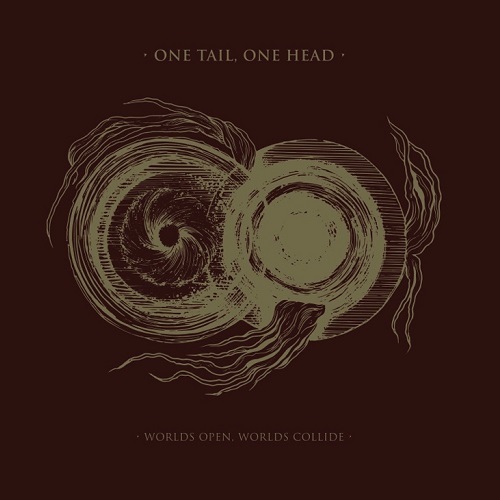 Mit ihrem starken Albumdebüt “Worlds Open, Worlds Collide” und einer Europatour mit Taake hätten ONE TAIL, ONE HEAD eigentlich nach zwölf Jahren Bandgeschichte endlich durchstarten können. Warum sich die Norweger stattdessen entschieden haben, die Band aufzulösen, mit welchen Gefühlen sie deswegen an die Shows herangegangen sind und wie es für ihn musikalisch nach ONE TAIL, ONE HEAD weitergehen wird, erklärt Gitarrist Jan Even Åsli im Interview. ONE TAIL, ONE HEAD wurde vor 12 Jahren gegründet. Was war damals die Idee hinter dem Namen? Es ist eine Zeile aus dem Text des ersten Liedes, das wir geschrieben haben. Der Name zeigt einfach zyklische Muster von Tod und Wiedergeburt, bildlich und wörtlich, auf, die von da an zum übergreifenden Thema wurden, das in den Texten zu unseren Songs immer irgendwie präsent ist. Als Bandnamen haben wir die Zeile gewählt, weil es seltsam klang und für eine Band wie die unsere sogar seltsam aussah. Euer Debüt heißt “Worlds Open, Worlds Collide”. Wofür steht der Titel? Nun, die Themen sind lose und suggestiv, also stehen sie offen für die Interpretation durch den Zuhörer und werden wahrscheinlich für jeden etwas anderes bedeuten. Für mich geht es vor allem um Zweifel, gebrochene Illusionen, zerbrochene Wahrheiten. Es bewegt sich auf einer Grenze zwischen Gewissheit und Unsicherheit, Kontrolle und Chaos, Realität und Wahnsinn. Hoffnung und Verzweiflung sind Welten, die für mich immer und immer wieder aufeinanderprallen. Diese Begriffe verspotten sich auch in gewisser Weise selbst. Sie wirken manchmal grandios und größenwahnsinnig, aber es lauern immer Zweifel und Angst vor der Vergeblichkeit dahinter, deswegen gibt es diese ständige Spannung. Eine unheimliche Pointe von schwarzem Humor, wenn du so willst. Was war das Konzept hinter dem Artwork, wie würdest du das Bild interpretieren? Es spiegelt den Geschmack von mir und unserem Bassisten Tylden wider, der es in einer langen Zeit der Diskussion und des Gedankenaustauschs erschaffen hat – wobei er natürlich mit seinen grafischen Fähigkeiten die eigentliche praktische Arbeit gemacht hat. Wir wollten etwas mit einem eigenen Gefühl, etwas, das nicht wie jedes andere Album-Layout in unserem kleinen Teil des Metal-Undergrounds aussieht. Die dunkelrote Färbung deutet sehr stark auf die Atmosphäre unserer Liveauftritte hin, und das einfache, aber (unserer bescheidenen Meinung nach) äußerst stilvolle und sehr effektive Kunstwerk unseres lieben Freundes Izzy vermittelt den Inhalt des Albums perfekt. Wir sind mit dem Ergebnis sehr, sehr zufrieden. Es sieht in allen Formaten großartig aus. 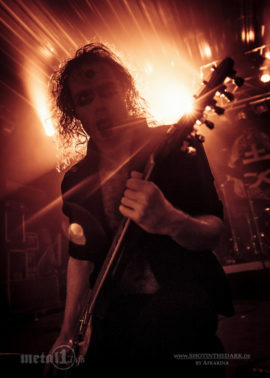 Mit „Sordid Sanctitude“ gibt es ein ziemlich langes Instrumental auf dem Album. Hätte hier Gesang nicht eventuell für mehr Dynamik gesorgt? Ich finde eher, dass es dringend benötigten Raum zum Atmen und sich Sammeln bietet. 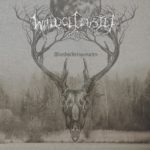 Der Gesang ist auf dieser Platte extrem präsent, und obwohl er (wiederum meine bescheidene Meinung) hervorragend gemacht ist, passt es nicht zu meiner Vorstellung von der dynamischen Balance, die ein Album haben sollte, dass dich ein Sänger 50 Minuten lang ununterbrochen anschreit. 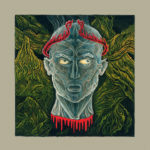 „Sordid Sanctitude” vertieft auch die Stimmung und erweitert den Horizont der Platte mit experimentellen Gitarren- und Bassmustern und einer insgesamt eher seltsamen Atmosphäre. Aber hey, ich bin da ziemlich voreingenommen. Ihr seid seit einigen Wochen mit Taake auf Tour – welche Erinnerungen und Erfahrungen hast du von der Tour mitgebracht? Es war alles in allem ein tolles Erlebnis, sehr lohnend als Mittel, um unser letztes Ziel zu erreichen und sehr emotional in dem Sinne, dass wir das Ende der Band direkt auf unserer Haut gespürt haben. Wir haben auf dieser Tour tatsächlich einige unserer besten Liveshows aller Zeiten gespielt. Das fühlt sich sehr gut an. Viel unterstützende Energie von den Fans in ganz Europa, viel mehr, als wir erwartet hatten. Wir hatten auch das Privileg, starke Freundschaftsbande mit Mitgliedern aller Bands knüpfen zu dürfen, was nach meinem Verständnis mehr ist, als man erwarten kann, sodass unsere ewige Dankbarkeit den Musikern von Taake, Bölzer, Orkan und Slegest dafür gilt, dass sie alle herausragende Individuen sind. Du hast es eben angedeutet: Die Tour war eure erste große Tour, aber eben auch eure letzte. Mit welchen Gefühlen habt ihr die letzten Shows gespielt? Wie bereits erwähnt, war da natürlich immer ein Hauch von Kummer. Aber davon abgesehen haben wir jeden Abend unsere Arbeit gemacht, ohne Kompromisse alles gegeben, ohne etwas zu verschonen. Das war für uns immer schon so, und daran hat auch nichts geändert, dass es unsere letzten Shows waren. Was hat euch überhaupt dazu bewogen, die Band jetzt zu begraben, wo ihr mit dem Album und der Tour international erfolgreich werdet? Wir ziehen innerhalb der Band in verschiedene Richtungen, in kreativer Hinsicht, aber auch was die Herangehensweise und Perspektive angeht. Wir wollen uns auf unterschiedliche Weise ausdrücken. So einfach ist das. Wenn unsere Herzen nicht für das gleiche Ziel schlagen, ist es besser, dieses Album zu unserer finalen Aussage zu machen und weiterzuziehen. Aber ist es nicht auch unbefriedigend, so lange auf etwas hingearbeitet zu haben, und jetzt, da der Erfolg kommt, diesen nur so kurz genießen zu können? Es gibt viele Arten, Erfolg zu definieren und zu messen. Eine ist, Shows zu spielen, beliebt zu sein und so weiter. Eine andere ist, etwas zum Ausdruck zu bringen, das wirklich dir entspricht und noch eine andere ist, deinem Werk wirklich in allen Aspekten verbunden zu sein. Das sind allesamt legitime Wege. Aber uns ist vor allem letzteres wichtig, weißt du? Und ONE TAIL, ONE HEAD war immer selbst ein Ziel – kein Werkzeug, um ein anderes Ziel zu erreichen. Das Leben ist kurz und es ist, was es ist. Das Publikum hat euch wirklich gefeiert. Bereust du die Entscheidung bereits, oder ist immer noch sicher, dass diese Tour das Letzte war, was wir von ONE TAIL, ONE HEAD gehört haben werden? Keine Reue. Im Moment ist dies hier das Ende. Ich sehe, worauf du hinauswillst. Viele Leute haben uns auch einfach nicht geglaubt, als wir verkündet haben, dass wir aufhören. Und ich verstehe das in gewisser Weise. Aus Erfahrung halte ich es für eine ziemlich dumme Sache, „nie“ zu sagen. Allerdings herrscht gerade ein ziemlich deutliches Gefühl von Endgültigkeit vor. Eine Sache sind die bereits genannten Gründe, eine andere sind die Veränderungen im Privatleben, die wir alle durchlaufen. Die hyperphysische und lächerlich extrovertierte Natur von ONE TAIL, ONE HEAD war sehr fordernd, und ich denke, es war ziemlich offensichtlich, dass das nicht ewig anhalten würde. Als Menschen kämpfen wir alle darum, die Dinge loszulassen, aber manchmal ist es wirklich das beste. Wenn ONE TAIL, ONE HEAD jetzt tot ist – wo siehst du deine Zukunft als Musiker? Wirst du dich wieder mehr auf VEMOD konzentrieren oder vielleicht etwas ganz Neues anfangen? VEMOD ist das Herzstück meines Wesens und damit auch das Herzstück meiner musikalischen Zukunft. Ich habe mehr als die Hälfte meines Lebens daran gearbeitet, also werden alle, die es interessiert, noch viel mehr von diesem kleinen Universum, das wir da geschaffen haben, hören – es sei denn, ich werde schwer krank oder sowas. Natürlich gibt das Ende von ONE TAIL, ONE HEAD viel Zeit frei, und wer weiß, was auf noch uns zukommt. Es gibt sicher auch Ideen, die nicht unbedingt zu VEMOD passen, so dass es durchaus möglich ist, das daraus neue Projekte erwachsen. Ich bin mir jedenfalls ziemlich sicher, dass du von allen Mitgliedern von ONE TAIL, ONE HEAD in verschiedenen neuen Konstellationen hören wirst, da keiner von uns mit Musik abgeschlossen hat. Vielen Dank für das Gespräch! Bitte lass uns am Ende dieses Interviews ein kurzes Brainstorming durchführen. Es tut mir leid, aber ich mag die Idee eines „kurzen Brainstormings“ über komplexe menschliche Phänomene, die man ein Leben lang studieren könnte, ohne sie auch nur annähernd richtig erklären zu können, nicht besonders. Ich hoffe, du entschuldigst, dass ich in einer Zeit, die so verzweifelt nach tiefen Gedanken ringt, keine weitere Oberflächlichkeiten verbreiten möchte. Hört gute Musik, passt gut aufeinander auf und bleibt gesund. Danke für eure Zeit.